The newest addition to the collection is Chicken Soup for the Soul: Country Music. I haven't read a Chicken Soup for the Soul book in a couple of years and after reading this one I realize that I've been missing out. I need to borrow my mom's collection and start reading more. I can share and enjoy these amazing stories with my children too. The Inspirational Stories behind 101 of Your Favorite Country Songs. Songs tell a story, and now many of country music's most famous singers and songwriters are sharing more of the story! These artists reveal the inspiration, influence, and background, and when and why they wrote their most famous songs, in this fresh collection of stories. The book also includes great photos of the songwriters and lyrics of many of the songs. 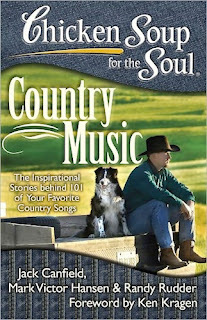 A great gift for anyone who loves country music! Visit Chicken Soup for the Soul and tell me which other title you would most like to read. A special thanks to Chicken Soup for the Soul for this great review and giveaway opportunity! I'd like Chicken Soup Think Positive. Love these books so much..."behind the music"
MANDATORY ENTRY: I am real interested in reading "Chicken Soup for the Soul: A Book of Miracles." I'm a HUGE Facebook FAN of Chicken Soup for the Soul. My Facebook ID: Kimberly Dunek-Buck. I am a Facebook FAN of Being Frugal and Making it Work. My Facebook ID: Kimberly Dunek-Buck. I follow your blog via Networked Blogs. My Networked Blog ID: Kimberly Dunek-Buck. I currently subscribe to your blog via email. Chicken soup for the mother' s soul. I would like to read Chicken Soup for the Pet Lover’s Soul. I follow Chicken Soup for the Soul on Facebook under the username likwan. I follow Chicken Soup for the Soul on Twitter under the username likwan.